I think I’m a better business owner than I am full-time employee. Mike was never cut out to be an employee. His approach to business always focused on the relationship more than the bottom line. Mike has always thought of himself as a business owner, even when he was still an employee. The only difference was, he was less motivated to hang on to contracts and to clients when he was working for someone else. At that time Mike realized that he should probably stop working for someone else, and start doing his own thing. However, Mike agonized over the same thought all freelancers do – is quitting my job for freelancing the right thing to do? I've always thought of myself as being unemployable. High-five. For Mike, it was. He shares what really motivated him to quit his full-time job and take on the work of three clients simultaneously. His best strategy is his skillset. Mike worked hard to set himself apart by specializing in a few niche skills. His knack for monitoring and his affinity for writing gave him the opportunity to start a weekly newsletter. Creating something like a newsletter or a blog is a key way to get your name out there and known by your niche market. Mike uses his writing talents to establish himself as an authority and further build his network by connecting with the clients who need him the most. The important thing to remember in the freelancing world is that you don’t need to have everything figured out. 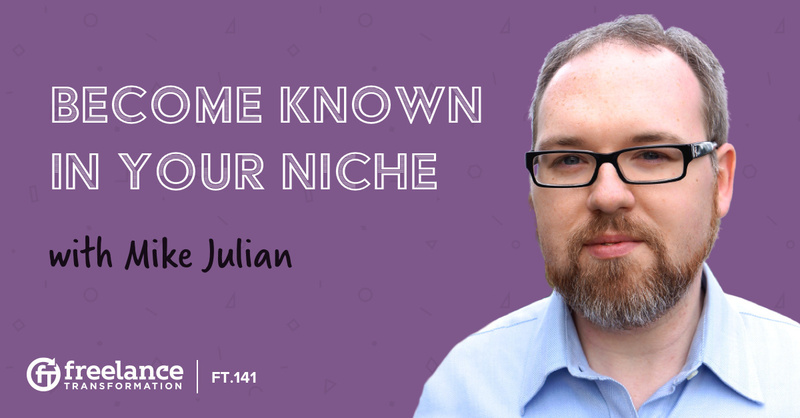 First, learn your niche skills so you can get started and set yourself up for success. Then you can start building your network. The network strategy for success that Mike’s shares isn’t really a strategy at all. It’s more of a routine that he practices regularly to meet new people and build relationships. I had been working on this network for years. I never really thought of it as a network. I just thought of it as making friends. Mike’s approach to finding his future clients wasn’t about finding clients, it was about connecting with people. He uses platforms like Meetup, a social meeting tool, to connect with other tech and monitoring entrepreneurs in his neighborhood. Mike’s meetings aren’t always about business, he also focuses on education and socializing with friends in order to meet his peers and understand their unique needs. Mike is lucky enough to live in San Francisco, California – an American city built on tech and startups. It puts him right in the middle of his niche, but connecting with them is still hard to do. Being in a field like application infrastructure monitoring means he’s monitoring tech security, so a lot of Mike’s clients don’t like to advertise their security failings. That’s where social media and casual meetings made it easier for clients to open up about what they needed from infrastructure monitors like Mike. Mike Julian didn’t create this kind of niche success overnight. But his unique approach to building business relationships before the sale set him up to meet the right kinds of clients who are willing to pay for the skilled work Mike specializes in. He put himself at the center of his community by organizing the groups and the meetings that connected all of his peers and potential clients. Authority is actually really easy to create, and I’ve done it accidentally. Once you establish yourself as an authority figure, your niche will start to respond to you in a way that builds your business. Mike’s tips for gaining this recognition come from the luck he created for himself. By always being willing to learn new things, Mike opened himself up to the opportunity for success. Learning the right kinds of skills to set yourself apart is the first step to gaining recognition in your niche, and what you do with it afterward is entirely up to you. I’ve put myself at the center of the monitoring community, and now people know who I am. To further build his own recognition, Mike decided to write a book that gives his ideal clients exactly what they need. His approach to running a business and publishing a book is inspiring. We will be lucky to have Mike back on the show again after his book becomes available for purchase to see how it has furthered his freelancing career.